Two sided print card print on 5.5" H x 4.1" W sized paper. 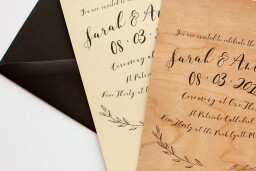 Yes you read correct, we offer invitations printed on real wood. At 0.45mm thick our wood stock feels like 300-350gsm paper. We use a digital printing process to print on wood which yields aesthetically brilliant results. It's cost effective and the inks and toner we use are environmentally friendly. A percentage of this print design purchase will go directly to Jessica. Expected Delivery Time : 5-7 working days from proof approval. This fantastic Simple Elegance collection by Australian designer Jessica Dimasi is influenced by simplicity with a twist and would look fantastic for those planning a simple style event. 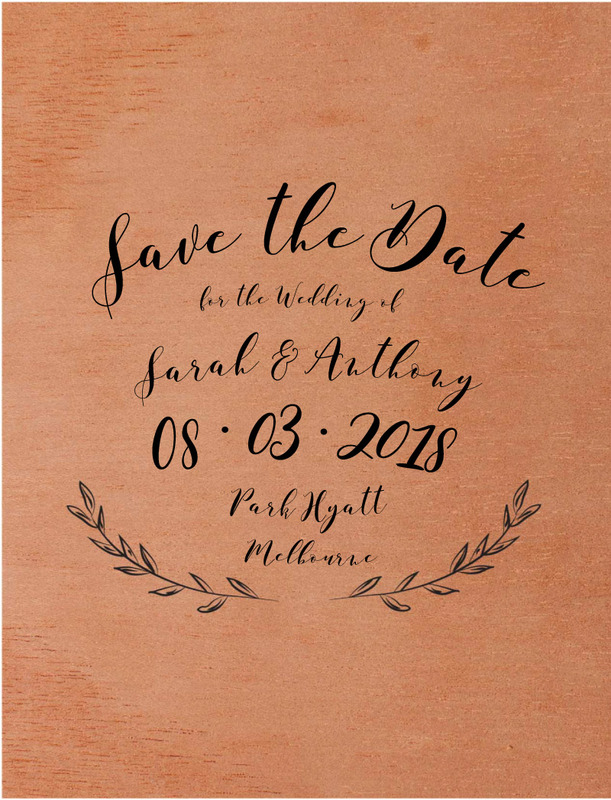 This Save The Date card from the sophisticated design set looks stunning when printed using Print On Wood and we think it looks stunning on Paperlust Wood.